The Garden is an olive grove; Gethsemane comes from the Assyrian for ‘oil press,’ which is what this part of the Mount of Olives was used for. An oil press exerts great force on olives to bring forth oil, and some commentators say that it is not coincidental that Jesus anguished here. The incredible pressure on Jesus as he prayed in the Garden was symbolic of the pressure of the ‘oil press,’ such pressure that it brought forth liquid from Christ in the form of bloody sweat (Luke 22:44). Later that night, He would be betrayed by Judas Iscariot (Luke 22:47 & Mark 14:43-51). 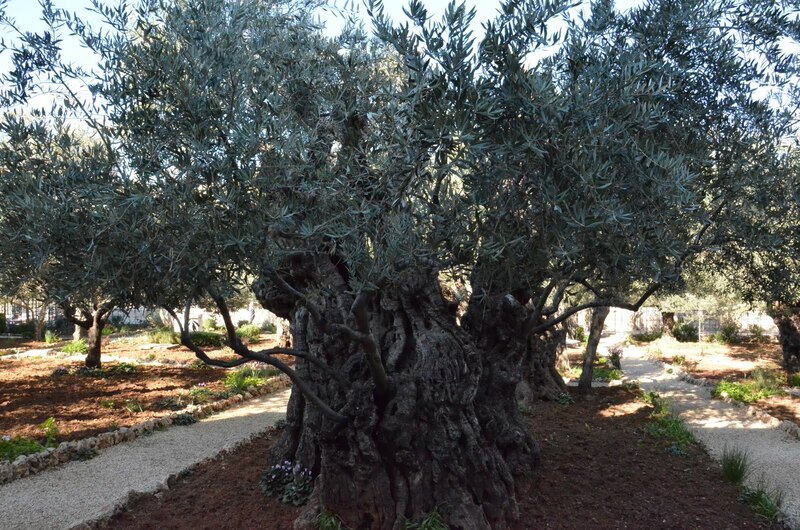 It’s incredible, but the Garden still has olive trees that are almost 2,000 years old! Unfortunately, according to some accounts, all the trees in this area were cut down by the Romans in 70 AD during the siege of Jerusalem; therefore, these threes are almost 2000 years old. The Garden is only a small walled-in area now, but once covered the majority of the mount. After taking some pictures and praying in family groups, we crossed the street that runs through the Garden, we entered another part of the Garden, where the Church of All Nations resides. This church, also called the Church of the Basilica of the Agony, was built in the 1920’s on top of previous churches and funded by several nations—all of whose national coat-of-arms are painted onto separate domes on the ceiling. The church was built to enshrine a piece of bedrock that tradition holds is the place where Jesus prayed that fateful night (Mark 14:32-42). 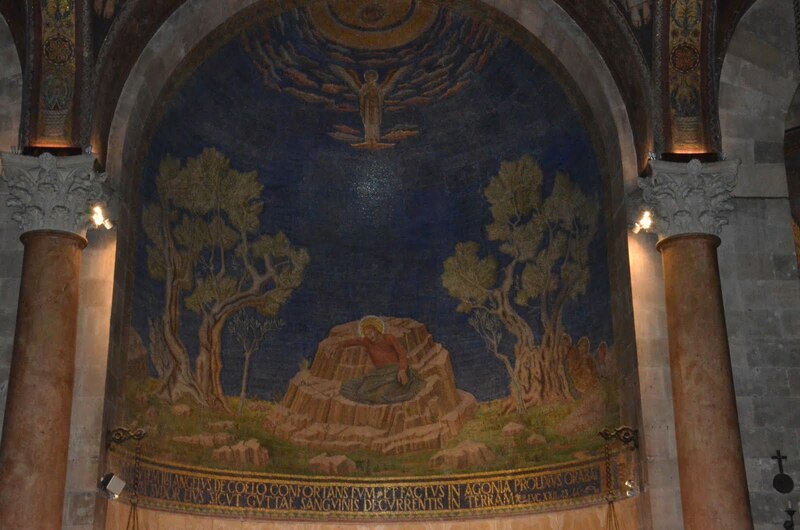 The interior of the church is beautiful with mosaics depicting Christ’s agony, betrayal and arrest. (Matthew 24:1-51; Mark 13:1-37; Luke 21:1-38). 3. 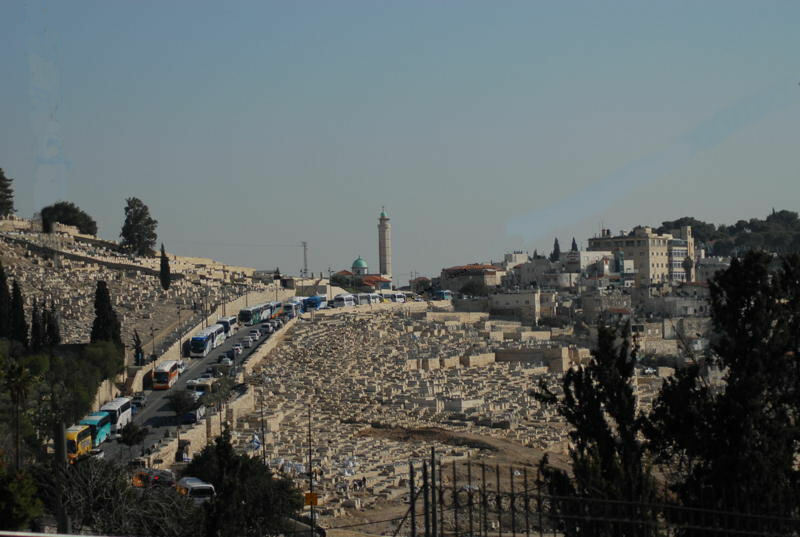 The ancient road from Bethany to Jerusalem passed over the summit of the Mount of Olives. Jesus would have walked that road many times visiting Lazarus, Mary and Martha.